My Bargain Basket: FREE Copy of "What to Expect Guide to a Healthy Home"! 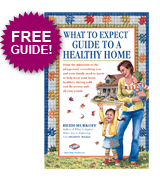 FREE Copy of "What to Expect Guide to a Healthy Home"! Get your FREE Copy of "What to Expect Guide to a Healthy Home" Here. Now you can better protect your family this cold and flu season - and all year long. This NEW guide is full of helpful information and simple ideas so you can keep your home and family healthier. Order now while supplies last. Thanks Recipes for Great Living (on a budget)!